This pose is fabulous! Be sure to include it in your yoga practice. It is the only area on your body you cannot see without a mirror. As a result, you do not have a direct connection with the area, just a reflection. The area is tight from the forward slump many of us wear with our posture. Ironically, the tension is really from stretched out muscles that have grown chronically weak. There isn’t much movement in the area anyway due to the attachment of the ribs. The ribs are attached to each of the thoracic vertebrae (the vertebrae that run from the base of your neck to your upper lower back) and therefore restrict the movement of those vertebrae. I read this fabulous metaphor at some point years ago and it has remained a vivid image for me when working with the spine. Think of your spine like a bicycle chain. Like a bicycle chain, it can get stuck links. When links get stuck, the looser links on either side of the stuck spot get all the movement and the stuck place remains stuck. The same concept occurs in our spines. We get stuck between a few vertebrae and the joints on either side of the stuck place get all the movement. Without consciousness, we continue to move from the loose places, creating more flexibility there and sometimes instability and the stuck places remain stuck. We need to bring more thought into our upper backs to loosen the chinks. Bring attention to the upper back and warm up the muscles. • Standing pose variations -- In both Parsvottanasana (Extended Side Stretch Pose) and Virabhadrasana I (Warrior I Pose), you can do a variation with the arms behind the back, hands clasped. It brings attention to the upper back. • “Cactus Arms” (as we call it – “stick ‘em up” is also fun) -- can be done standing or lying down. Start with arms at 90 degrees, hands down. Rotate the upper arms outward, bringing the hands up to the position in the photo. The action draws the shoulder blades strongly into the back. • There are many variations of Salabhasana (Locust Pose) that help bring more awareness into the upper back. • Of course, backbends over various objects such as blanket roll, chair, or ball are helpful. My favorite variation is backbend over a block. I can slowly move the block bit by bit up my back to use the edge to bend at my “stuck” spots. (It feels MUCH better than it looks!) You can do it at any of the heights of the block. If you are at the two lower heights, you can sit on your buttocks and keep your knees bent with feet on the floor. If you are at the highest height, sit in Vajrasana. You can see me in the photo. I lifted up off the floor to get into the pose and then allow both my hips and my upper body to move down into the pose. • Sphinx: Another excellent variation for “awakening” the upper back. Placing your arms in a variety of positions helps you really get into the upper back. Check out Musasana and the pose of the month: Salambhasana (Locust Pose). Here are some Study Points for you as well as a few other posts. Such an easy pose. It is fabulous for taking the spine through its entire range of movement. Here is a variation for getting more movement into your vertebrae in your upper and lower back. 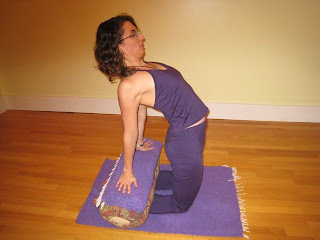 • Of course, backbends over various objects such as blanket roll, chair, or ball are helpful. My favorite variation of this one is backbend over roll a block. I can slowly move the block bit by bit up my back to use the edge to bend at my “stuck” spots. (It feels MUCH better than it looks!) You can do it at any of the heights of the block. If you are at the two lower heights, you can sit on your buttocks and keep your knees bent with feet on the floor. If you are at the highest height, sit in Vajrasana. You can see me in the photo. I lifted up off the floor to get into the pose and then allow both my hips and my upper body to move down into the pose. • Maricyasana III – In this variation, you place your hand on the wall. Use the wall to help you really get the shoulder blade in and to get the twist higher into your back. • Standing pose variations - In both Parsvottanasana (Extended Side Stretch Pose) and Virabhadrasana I (Warrior I Pose), you can do a variation with the arms behind the back, hands clasped. It brings attention to the upper back. • Salabhasana: There are many variations of Salabhasana (Locust Pose) that help bring more awareness into the upper back. o Arms overhead: This variation is a bit tricky and probably warrants its own post. For now, suffice it to say the lift needs to come from the mid-back, not the upper trapezius (across the top of your shoulder). If you life your arms and your shoulders contract (bringing them to your ears), you are not using the correct muscles. Stay tuned and I will write more later on this one. Next post: Getting directly into the stuck spots! I taught backbends in class today, in particular going more deeply and mindfully into the upper back. There are two places to work to go more deeply into your upper back: drawing the shoulders down and lifting your heart. Usually you can do one or the other a bit more even when you feel you are in your deepest pose. Try it! A few years ago I had the privilege of studying with Jo Zucovitch at Mind Body Solutions. She is an amazing, open-hearted teacher who gave me many great gems. Here are a couple I want to share with you for Ustrasana. These variations are incredible for opening the heart and really getting a lift in your chest. Since I have been practicing them, I have felt a tremendous opening in both my chest and my upper back. I hope you enjoy them too! The first variation is helpful if your student or you is really tight in the chest. Turning the palms out, rest them on a bolster (or bolster with blanket or two as you can see I have in the photo). Be sure you have enough lift that you can really press through your arms. Use the press to lift your chest and roll your arms open even more. Look forward so you can see your chest and watch as you lift it up more. This next variation won’t be possible with a student who is tight across the chest. (Have her repeat the first variation if this one is too deep for her.) Lace fingers behind your back. With an exhale, roll the shoulders back and down firmly. If you cannot straighten the elbows and keep the fingers laced, this pose is too deep for your shoulders. Continue with the first variation to prepare for this one. If you can keep your fingers laced, turn the palms down by taking your thumbs down your buttocks. (This move can be confusing because you can go both ways with the hands. If you go the other way, the shoulders will hunch, though.) Then go back to the bolster and again, use the bolster to get the lift in your chest. After these variations, by the time you get to full Ustrasana, it will seem easy!